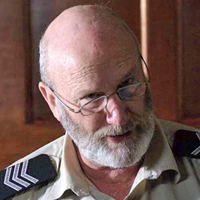 Bill McCluskey plays Sergeant Bob Temple – Police Prosecutor. Bob has a good sense of right and wrong, but he’s not progressive. Deep down he still believes that the “stolen generation” had it better than the Aboriginals who stayed behind. However if someone is hurt or preyed upon, he is perfectly willing to make sure that justice is served. With the local police gunning for Peter, Bob is called upon to back up the Magistrate in more ways than one, however, he has to confess that the new harder line version (Terri) is more to his taste. Despite being used to towing the party line, Bob is sorely tested when the details of a death in custody emerge and he has to go against one of “his own”. A NIDA Graduate, Bill has been involved in numerous productions in theatres around Australia in his capacity as an actor, director and playwright over the past 20 years. He has worked extensively with the Sydney Theatre Company, the West Australian Theatre Company, the Melbourne Theatre Company and the State Theatre Company of South Australia. Bill has also been involved in numerous Australian television and film productions, such as Evil Angels, Shame, Teesh and Trude, Parallax, The Shark Net and 3 Acts of Murder. Bill is also the Drama Coach on The Circuit, working with the many Indigenous non-actors required on the series. It’s a sweaty, dusty journey for city lawyer, Drew Ellis, and the travelling Circuit team as they face new cases and new dilemmas. Drew Ellis joins the challenging world of the Kimberley Circuit Court. One law for two cultures doesn't equal a fair go.